The campaign for Britain to stay in the European Union has taken huge lead in a poll of people who say they will definitely vote. With just a few days to go, “Remain” has a 7-point lead over the rival “Leave” camp ahead of Thursday’s EU membership referendum, according to a poll for the Telegraph. Remain leads Leave by 53% to 46%, with 2% saying they don’t know. The poll was carried out by ORB International and had a survey size of 800 people. Perhaps more importantly, the poll showed that the proportion of Remain supporters who say they will definitely vote jumped to 69%, from 54% two weeks ago, while that figure for the Leave camp fell to 64%, from 69%. That erodes one of Leave’s main hopes — that their supporters are more motivated to vote than those of Remain. The surge in support for Remain has happened since Jo Cox, a member of parliament for the opposition Labour party, was shot and stabbed to death by a man who gave his name as “death to traitors, freedom for Britain” when he appeared in court on Saturday. It has been an unpredictable campaign. 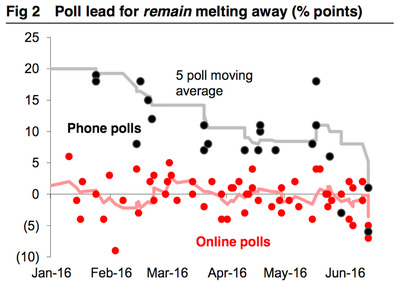 The Leave camp, which had been trailing Remain for months, had briefly taken the lead in the polls last week. According to the Telegraph poll, Leave had a one-point lead over Remain in the same survey on June 13. 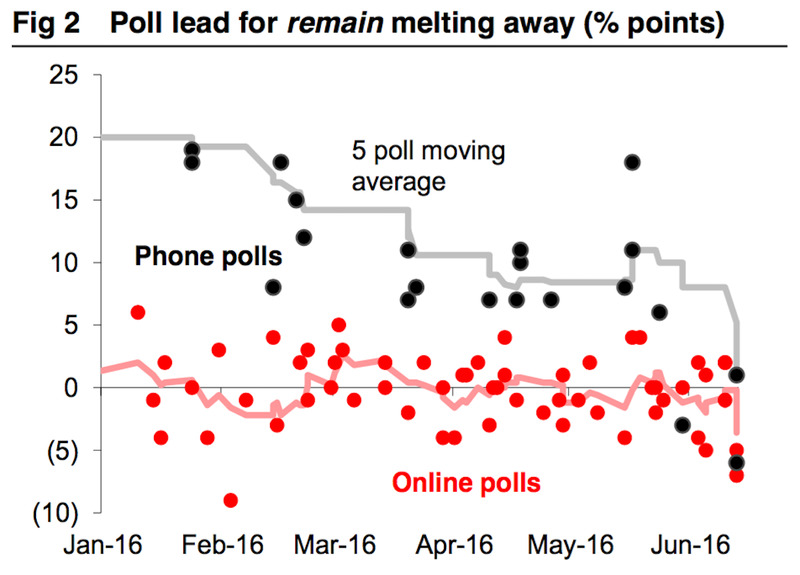 Early last week, three polls published within the space of just four hours all indicated leads for Leave. 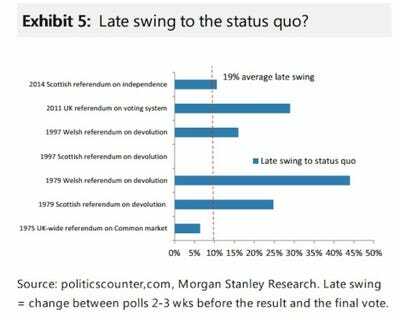 Surveys produced by Survation, Ipsos MORI, and BMG had all given leads to Leave. 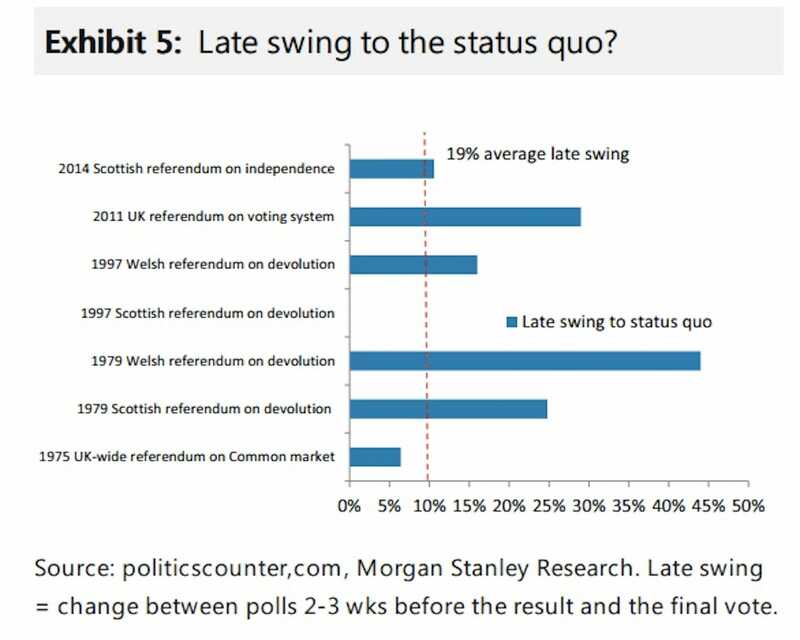 Quite often, referendums see a late swing towards keeping the status quo because change is seen as a risk. According to the Telegraph poll, 27% thought Remain was a risk compared with 56% for Leave.